Haiti switches on to solar power as sustainable electricity solution. Mirebalais is just an hour's drive north-east of the Haitian capital, Port-au-Prince, but in terms of technological distance travelled, the town might as well be on another planet. On moonless nights, much of the capital is dark; its shacks and makeshift roadside stalls are lit only by flickering candles or small kerosene lamps. It could hardly be otherwise in a country where only about 20% of the 10 million population are estimated to have access to electricity, the lowest percentage in the Caribbean. But Mirebalais is home to a new, well-lit public hospital that can hum with activity round the clock. Seven months after the world's largest solar hospital opened its doors, its 1,800 rooftop solar panels have generated enough energy to charge more than 19,000 electric cars, run six surgical suites, attend to 60,029 patients and safely deliver more than 800 babies. For Haiti, the hospital is a shining symbol of what the future might look like, powered by the island's plentiful sunshine. More than 60% of electricity generation is unsustainably based on imported diesel, mainly from Venezuela. The overwhelming majority of Haitians rely on charcoal and wood for fuel, contributing to rampant tree-felling that has reduced forest cover to the perilous level of 2%. The search for cleaner, greener alternatives has become increasingly urgent. This is driving an initiative to literally light up Haitian lives, especially in poor off-grid areas such as the camps that sprang up around Port-au-Prince after the devastating 2010 earthquake, as well as deep in the rural hinterland. A consignment of 12,000 WakaWakas (Swahili for shine bright) solar lamps, made by a Dutch company, arrived in October after a 10-month "buy one, give one" campaign, mainly in the US. They are being distributed free or for symbolic recompense in the form of community service through a network of non-governmental organisations identified with help from the Clinton Global Initiative. "This is the biggest endeavour that has brought high-quality personal, portable and self-sufficient solar LED lighting to Haitian families," said Elanna Veldkamp, of Off-Grid Solutions, which manufactures the lamps in China. "The scale of this campaign provides for a real and lasting change." Addressing Haiti’s Energy Challenges: a Key Priority in the Years to Come. The student who studies in the evening and the hospital that must operate around the clock have one thing in common: they need electricity. More than two years after the 2010 earthquake, Haiti's energy supply remains a significant challenge. "EDH van kouran, EDH pa fekadokouran" (EDH sells electricity, EDH does not give away electricity) can be read on the shirts of participants at an awareness-raising activity in Cayes on the need to pay electricity bills. 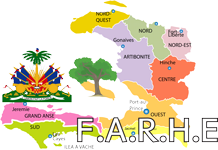 Haiti’s electricity company [L’Electricitéd’Haïti EDH], the largest State-run enterprise, which constitutionally has a monopoly to sell electricity, is trying to explain to Haitians that the EDH is a commercial enterprise that risks bankruptcy if it doesn’t generate revenue. "This is a sales office of the EDH, but the clients don’t understand this," explains Mr. Balde, manager of the Pétionville office. In order to provide ongoing service to citizens, the State must subsidize the EDH with about US$200 million per year. The shortfalls in the enterprise’s revenues have a disastrous effect on the maintenance and much needed expansion of the networks. Since 2006, the World Bank has sought to improve the quality of electricity supply and strengthen the financial and operational management of the EDH through the Electricity Loss Reduction Project (Projet de Réduction des Pertes du SecteurElectrique PREPSEL). PREPSEL is expected to be strengthened by the end of the year through substantial additional World Bank assistance to the energy sector. Energy is one of the five "Es" of the government’s program (along with Environment, Employment, Education, and Establishment of the rule of law) and it needs resources to boost investments and the reconstruction effort. In this context, PREPSEL seeks to improve the output of the EDH through better business management and a client-centered approach. Since 2011, PREPSEL has facilitated the establishment of a computerized Business Management System (Système de GestionCommerciale SGC) at the company’s headquarters and at each sales office in the metropolitan area. Long-distance communication via the Internet is helping to improve client service, reduce the processing time for requests, and correct problems more quickly.Since 2011, PREPSEL has facilitated the establishment of a computerized Business Management System (Système de GestionCommerciale SGC) at the company’s headquarters and at each sales office in the metropolitan area. Long-distance communication via the Internet is helping to improve client service, reduce the processing time for requests, and correct problems more quickly. "Because of the SGC, clients’ monthly bills can be generated in real time rather than every two or three months, as happened under the old management system," confirmed Mr. Balde. The work on the ground is, however, a long-term undertaking for which staff is expected to receive ongoing training. In addition, speedy alternatives are necessary to address emergencies. After the earthquake that rocked Haiti on January 12, 2010, the World Bank, with financial support from the Global Environment Facility, started an emergency operation distributing solar lanterns to the affected population. There was a pressing need for portable, individual, and self-sustaining lighting solutions to provide the basic lighting needed for family life, personal security, and the care of the injured. 5,000 solar lanterns were distributed free of cost in 2010 (two-thirds of which through the EDH), benefitting some 200,000 persons and more than 260 camps. The post-earthquake situation increased acute awareness of the need to address the existing energy gaps. The additional assistance being negotiated with the World Bank is expected to include a clause that allows for the allocation of emergency resources, based on the extent of the damage. "In the event of problems, this would offer a quick financial response," explains Mr. Cange, EDH project coordinator for World Bank financing. The Financial assistance would facilitate the purchase of equipment or the use of local companies to repair distribution lines in cases where the EDH does not have suitable equipment. The EDH could also ask external companies or consultants to repair high-voltage power lines. It is clear that the EDH must play an important role in restoring energy security and overcoming the many challenges that remain. Furthermore, alternatives like the solar lanterns distributed by the World Bank are environmentally sustainable solutions, easy to use, and increasingly popular.